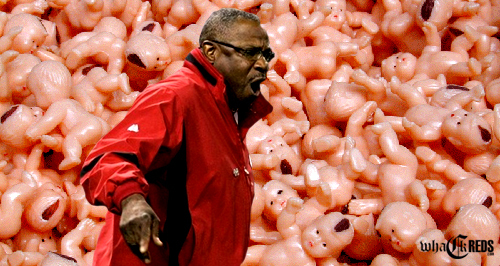 Reds' manager Dusty Baker is in the final year of a three-year 10.5 million dollar contract. On August 18th, after leading his team to a 68-51 record and a legitimate shot at the playoffs for the first time since 1995, Baker was offered an undisclosed contract extension by the Reds. Baker is still considering Walt Jocketty's overture. "We just got the proposal a few days ago,” Baker said. “We’re still evaluating it. I’ve got to look at where were going and what I want to do. I’m concentrating on winning. I’ve said that all along. Everything is cool. It will work out." Currently setting a season-high in games over the .500 mark (20) and games ahead of the second-place St. Louis Cardinals (5), the Cincinnati Reds are making serious noise in the National League. With Joey Votto leading the team in offense, and Jay Bruce along with Drew Stubbs having impressive Sophomore and Junior seasons, the young Reds are getting it done despite rumors of Dusty Baker favoring older and more seasoned players. In the position of handling a team with such great young talent when taking over the Reds in 2008, many thought the situation would quickly turn disastrous for Baker. While managing in San Francisco ('93-'02) and Chicago ('03-'06) Baker's success relied on veterans, but with the Reds it seems that Baker has learned to mesh the old with the new while creating a serious force to be reckoned with in the NL Central. Joey Votto (26) and Jay Bruce (23) are both currently participating in their third full major league seasons. Drew Stubbs (25), who avoided the 2010 rookie tag by compiling 180 at-bats last season, is playing in his second. Bruce and Stubbs have spent their entire major league careers managed by Dusty Baker while Votto has played 402 games for the Reds' skipper. Votto played in 24 games during the Reds 2007 season under interim manager Pete Mackanin. Through Sunday, Joey Votto has hit 81 homeruns, drove in 261, and composed a .315 batting average during his three seasons under Dusty Baker. Along with Albert Pujols, Votto is becoming a determined contender for the National League Triple Crown. The humble first baseman is also a solid MVP candidate while quietly leading the Reds, old and new, to the post season. This season Votto is hitting at a .325 clip (2nd), has driven in 93 runs (2nd), scored 91 times (tied with Brandon Phillips for 2nd), all while matching Jay Bruce's jersey number in the homerun category (tied with Adam Dunn for 2nd). After off and on performances this season, Jay Bruce and Drew Stubbs have both put it together during August. Hitting just .230 in June and .213 in July, Stubbs is having by far his best month of 2010 despite limited playing time (15 games started). With a greatly improved .313 average for the month, along with ten runs batted in, six stolen bases, 16 runs scored, and two homers, Stubbs will likely become more of a regular again come September. Jay Bruce has flat out caught fire during August. After leading the Reds to a 7-1 victory over the Cubs on Friday night as he drove in five runs with three long balls, Bruce is currently sitting on a .316 average with seven homers and fifteen RBI for the month. If Dusty's youngsters can continue the pace they have set this month throughout September, the chance of the St. Louis Cardinals catching them in the standings will descend quickly. Dusty Baker's surprising youngsters, along with his accomplished oldsters, are no longer a speculation; they are absolute. Up next for the Reds are the Milwaukee Brewers beginning on Monday. The Reds have won four of five previous decisions against Milwaukee this season as they outscored them 35-16. As the Reds and Brewers play three games in Cincinnati, St. Louis will play three in Houston. Whack Reds will be appearing on I-70 Baseball Radio during their Monday night (11pm ET) live broadcast. Make sure to tune in. We will be discussing the upcoming Reds and Cardinals series, the NL Central, and whatever the hell else we feel like spewing.